Hurray! 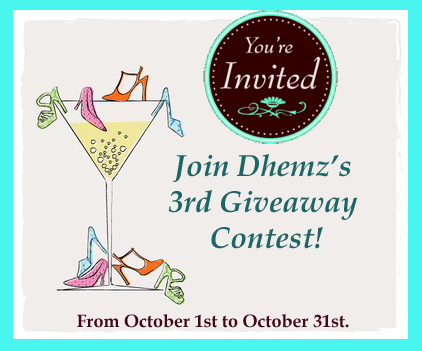 Dhemz will host another blog contest that will run from October 1 to October 31. This is her 3rd giveaway contest. Big prizes await the lucky winners so check it out now! A blogger who gains the highest number of first comment on her 5 blogs wins. 2. Blog about the contest and place the badge on your side bard. 3. And don't forget to link the url of your post. Naku mananalo ka naman nyan sis hehehe.. Goosluck satin! Mwah!